When we were talking about the prospect of having a third baby one big thing that would have to change would be our working situation. Our old office was upstairs in what should have been our third bedroom and we needed an office as both of us worked from home. We talked at great length about what we could do about this, discussing Jon going and renting a little office somewhere nearby or perhaps converting part of our garage, but we couldn’t decide which would be better. 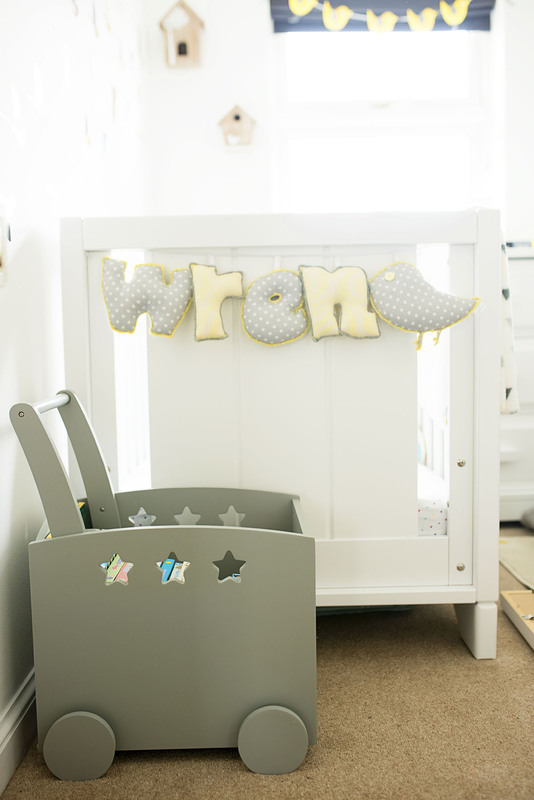 One thing we did agree on though was that we didn’t need to rush into making a nursery for our baby boy like we did with the girls before they were even born, it could wait until he was a little bigger. Fast forward ten months and our baby boy has only just gone into his room. This was partly due to the fact that we co slept and I loved having him next to me and partly because we just didn’t get round to sorting out our office situation until recently. However we finally got ourselves sorted and have created a small office conversion in our garage (I will do a room tour on this soon! ), which meant that finally he could have a room of his own. Here is the view of his room as you stand at the doorway. It’s only a very small room, in fact you would struggle to fit a single bed in there, so we decided to forsake a wardrobe this time. 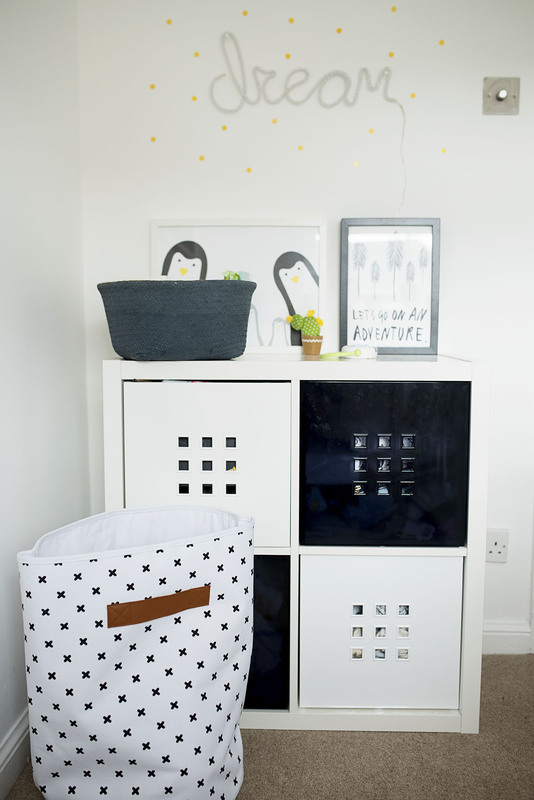 His chest of drawers and his cot are the Eton Expandable range from Boori. We actually managed to get rid of our old cot to a friend as we thought we were done having babies, but secretly I am now pleased as I absolutely love his cot bed, plus it will grow with him as he progresses into toddlerhood and beyond. It is really chunky and a gorgeous quality. Originally we thought the chest of drawers would have to go against the opposite wall, but it fitted perfectly next to the cot. This frees up space for him to play down on the rug as he gets a bit bigger. As you go into his room on the right hand side I put in an old IKEA Kallax storage cube that used to be in our office. I really need to sort through the drawers but I am going to put things like shoes, toys and other bits in there. 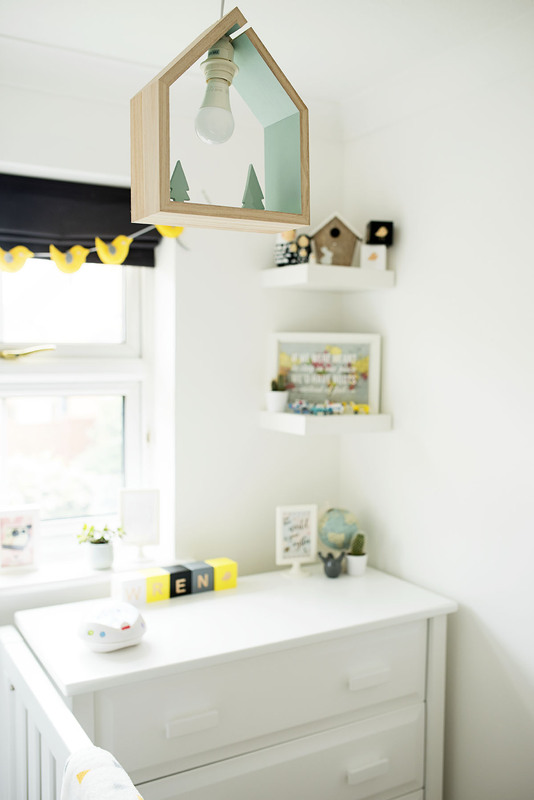 I love the Kallax storage, it’s really good value and neutral, we have a few dotted around our house. 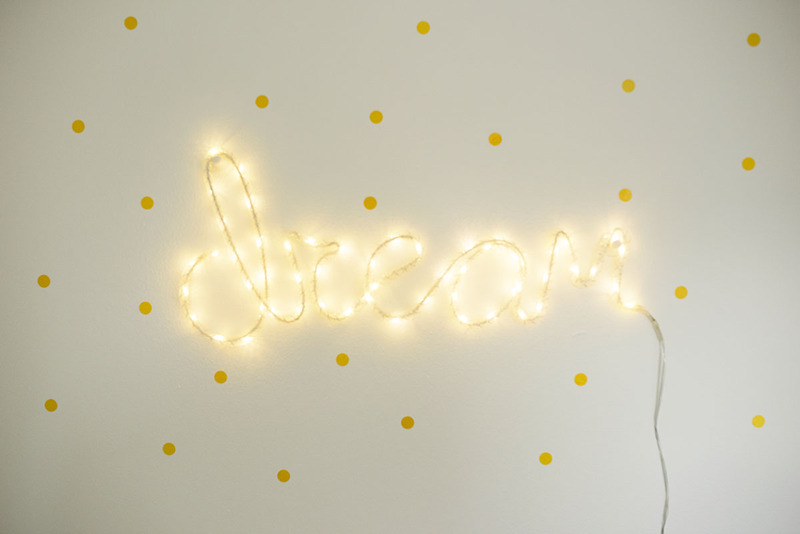 I found this Dream light on Not On The High Street and I absolutely love it. It’s battery operated so doesn’t need to be by a plug, and it’s nice to put on in the evening to give the room a subtle glow. I wanted to make sure I put some of his toys upstairs so he could play with them while I was getting ready in the morning. 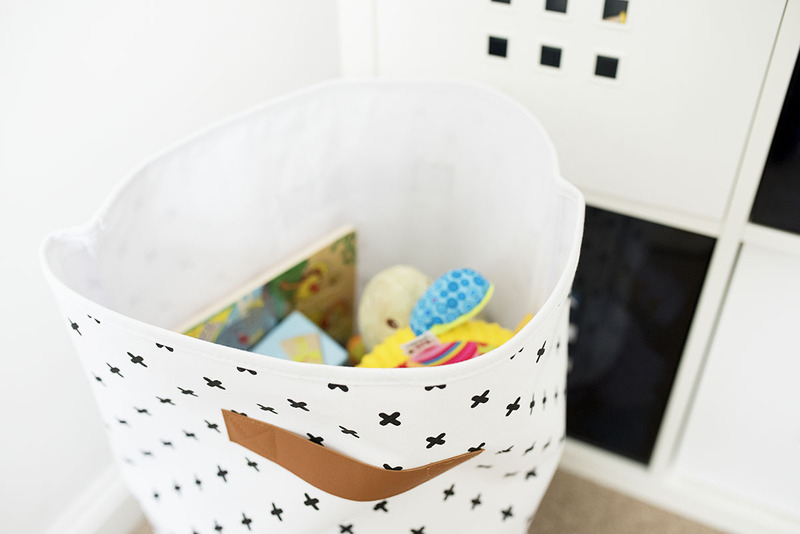 I found this great canvas storage bag on Vertbaudet, which is similar to some much more expensive designer ones that are triple the price. I thought this was perfect for his toys and means as he gets bigger he can get to them easily. I got this little grey wicker basket from Vertbaudet to put his nappies and wipes in, mainly so we could get to them easily. 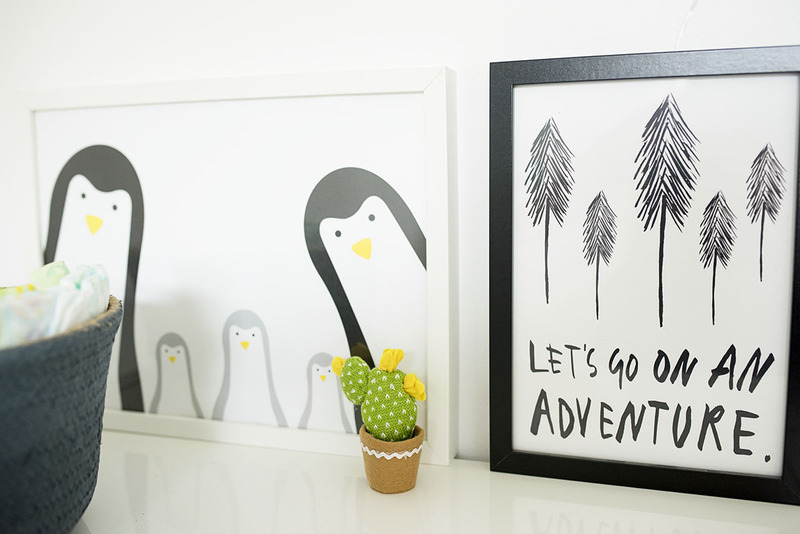 I still want to put a few more trinkets on top of here, but the little material cactus is from This Modern Life, the family of five penguins print is from my good friend Alison when Wren was born, and the ‘Let’s go on an Adventure’ print is from Not on The High Street. 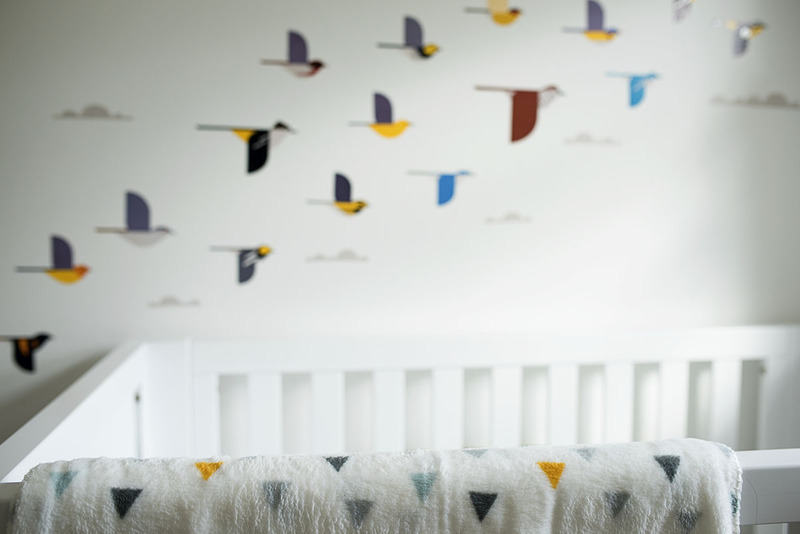 I originally wanted to get him some grey or black bird wall stickers to go up the side of his cot, I did originally order some but there was a problem with my order and they ended up refunding my money. 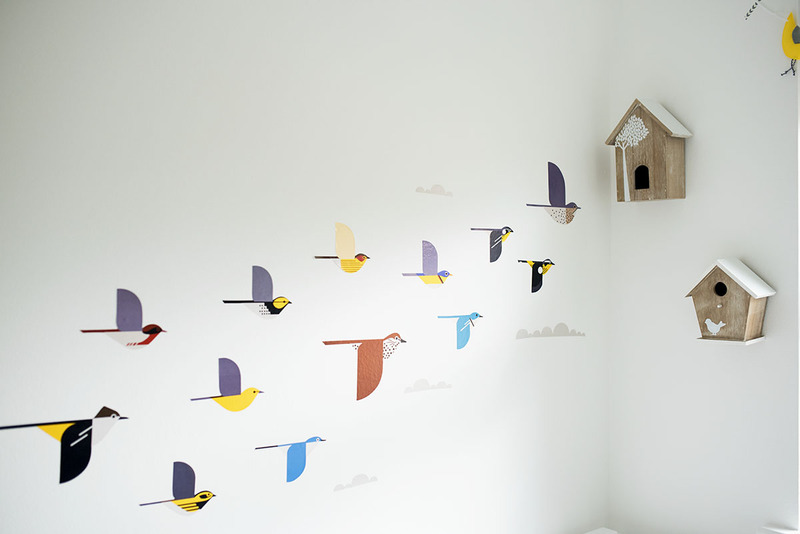 While I was searching online I found these gorgeous colourful bird wall stickers from a company called Trouva. I couldn’t be more pleased with them and it is one of my favourite parts of the room. 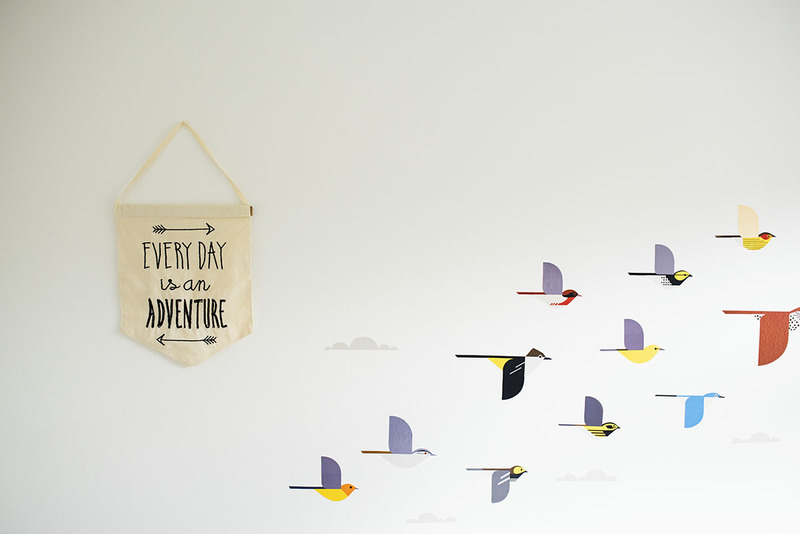 I love the fact that it looks like they are flying up into the bird boxes. 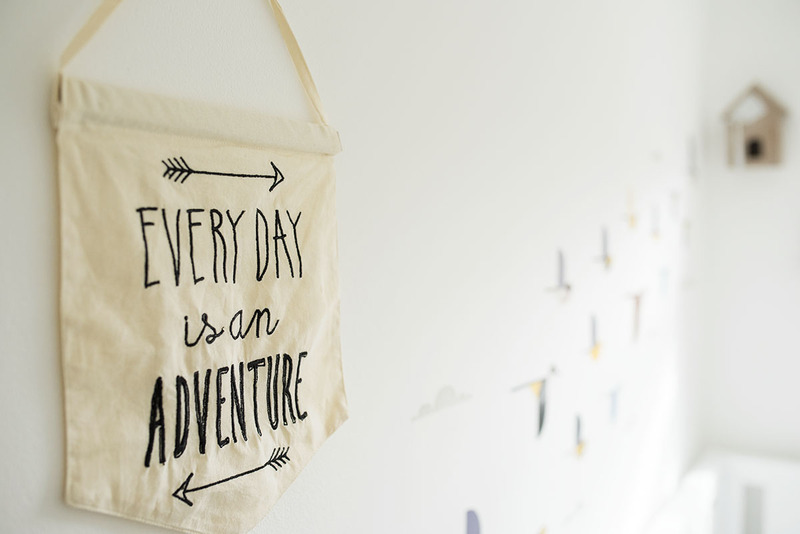 The ‘Everyday is an Adventure’ banner is from This Modern Life. 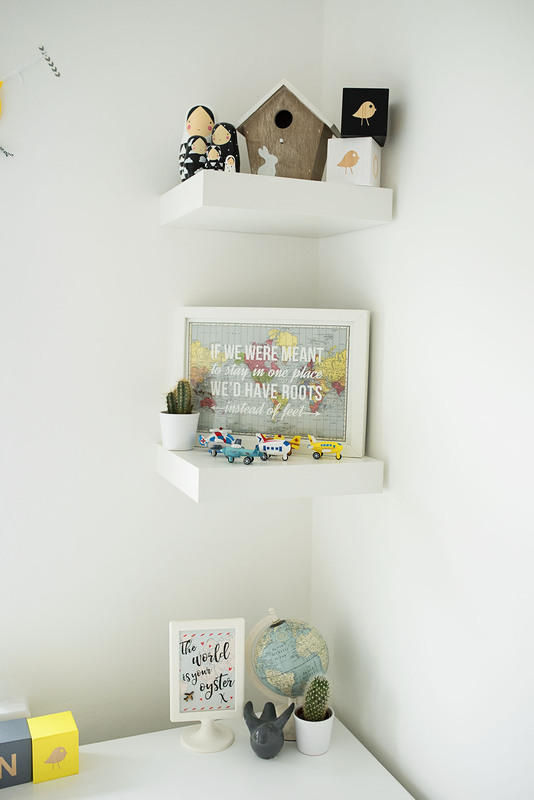 We put two IKEA floating shelves up in the corner of the room, purposefully so we could put trinkets on. Some little trinkets, I love the globe. 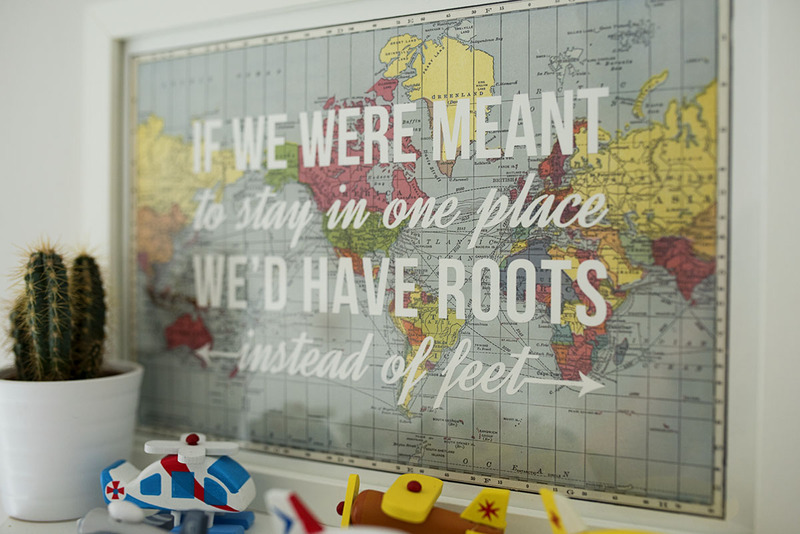 I grew up with a big globe in my bedroom and I loved pointing out different countries to my Dad. 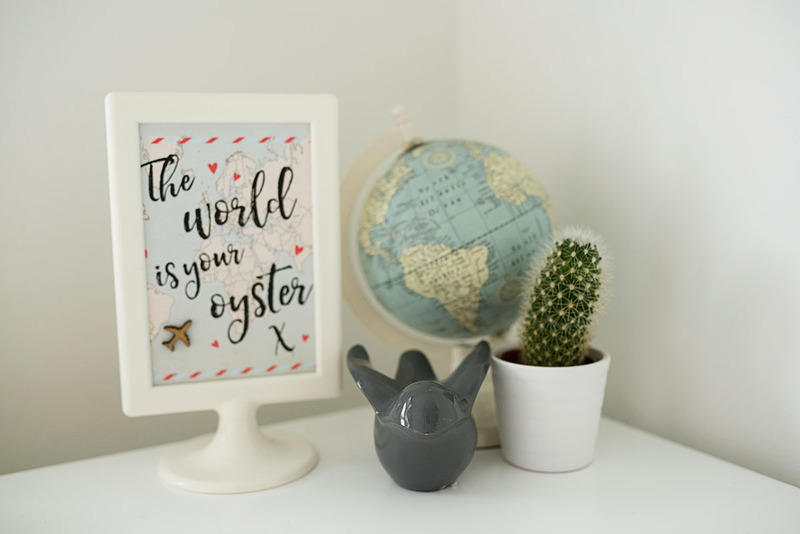 ‘The World is your Oyster’ postcard is from Not On The High Street, I find postcards a great way of adding prints to a room without them being ridiculously expensive. 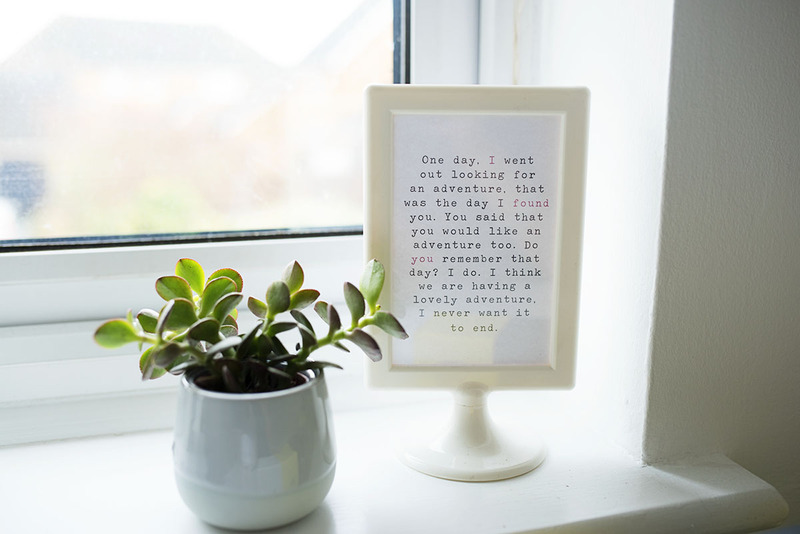 Those funny photo frames are from IKEA and are ridiculously cheap, like a £1 for two frames or similar. 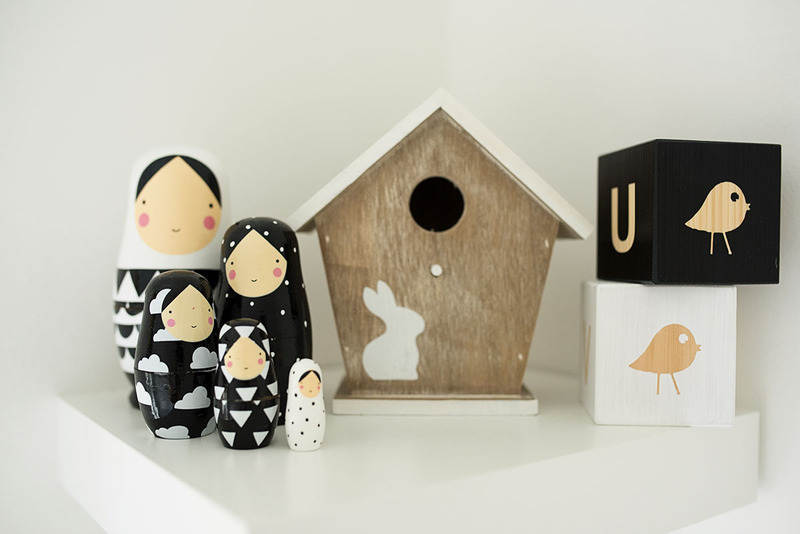 Jon bought me this Russian dolls from Sketch Inc a few years ago and I thought they would look lovely there. 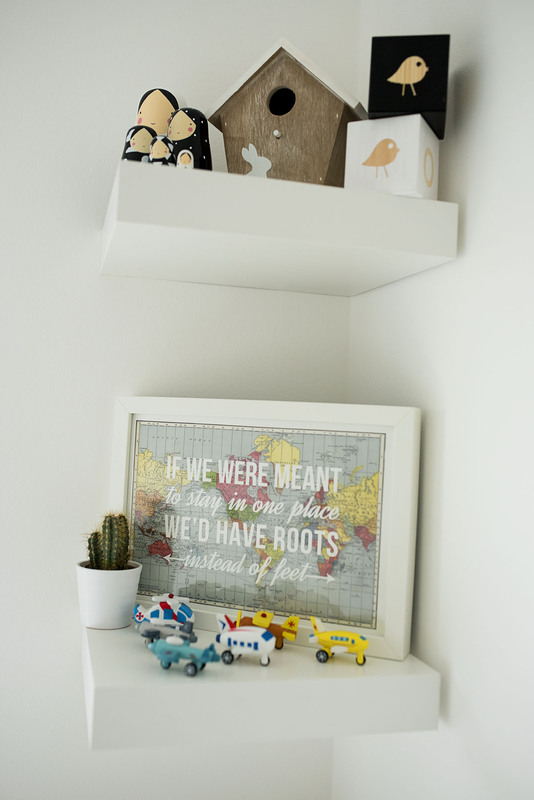 Another mini plant from IKEA and I love this print from Not on the High Street, it reminds me of how I feel about our baby boy. I’ve had these custom bricks since before he was born. 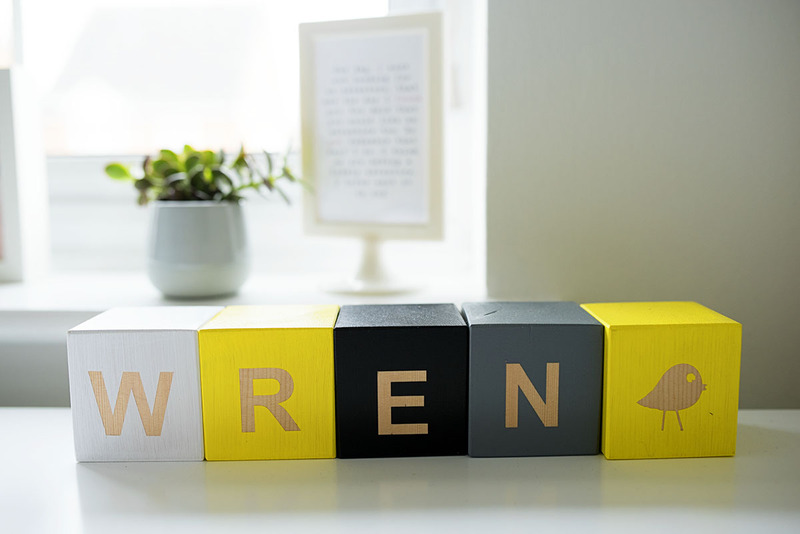 The lady is on instagram (Myla and Oscar) and she came up with exactly what I wanted- grey, yellow, white and black with a little bird on as well. I think they look really nice sat on there. 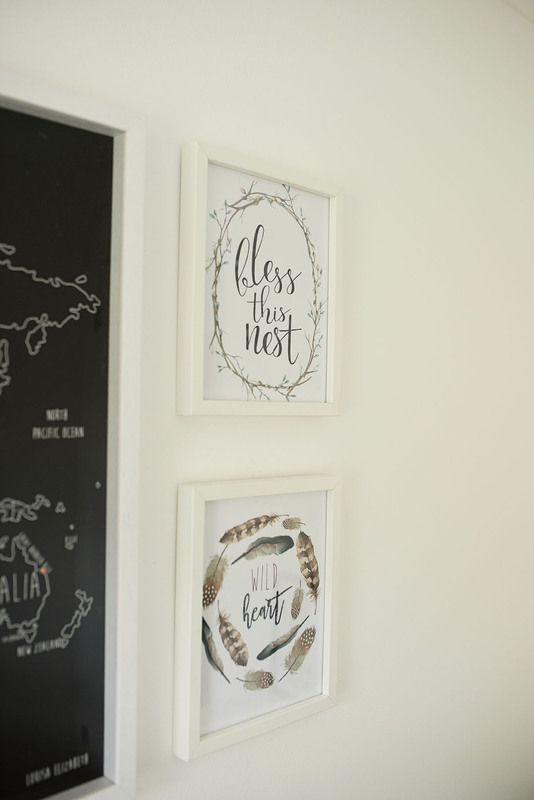 I found out about these Freddie the Kid prints from my friend Sarah at This Mama Life and I thought that they would go perfectly in my bird themed nursery. 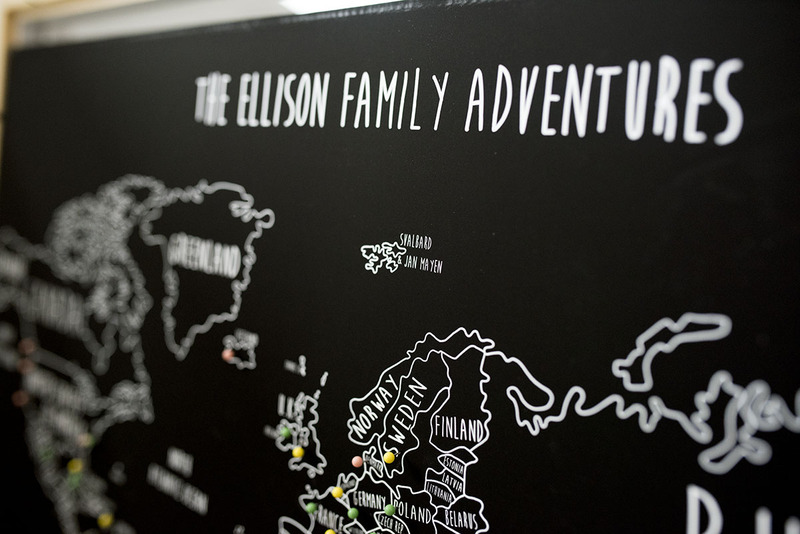 One of my most favourite parts of the room is his custom map by Louisa Elizabeth. 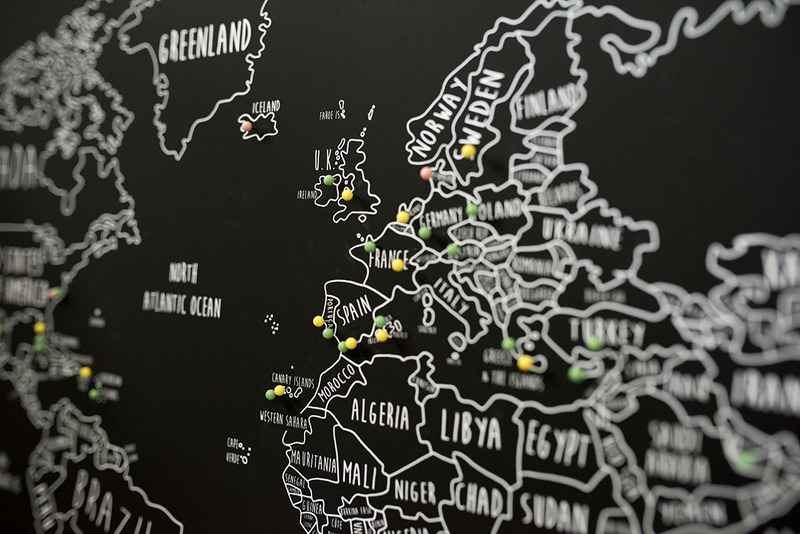 For a long time now I have been looking for a map that we can pin where we have been on to it. I just hadn’t been able to find anything I liked, until I found Louisa Elizabeth on Not On The High Street. It couldn’t have been more perfect for what I wanted. 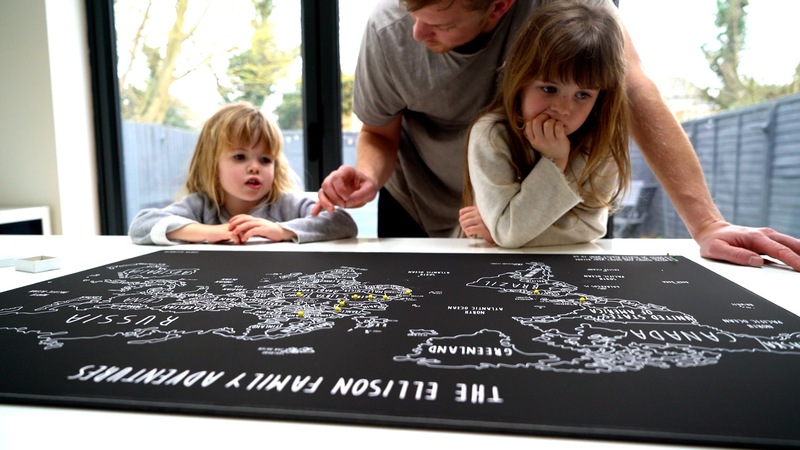 She has a variety of maps in different colours and sizes, and you can choose your key to correspond to your travels. 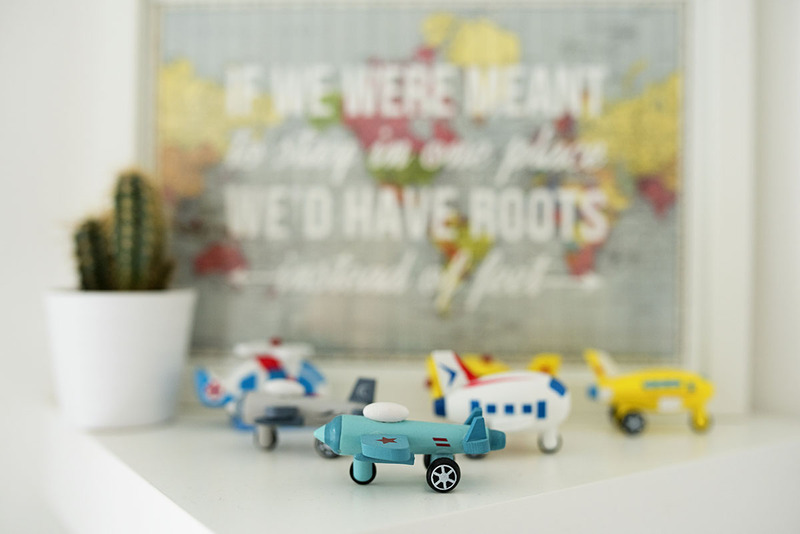 We had a great time discussing where we wanted to go and where we have been- I love that our girls are showing as much of a passion for travel as we do. 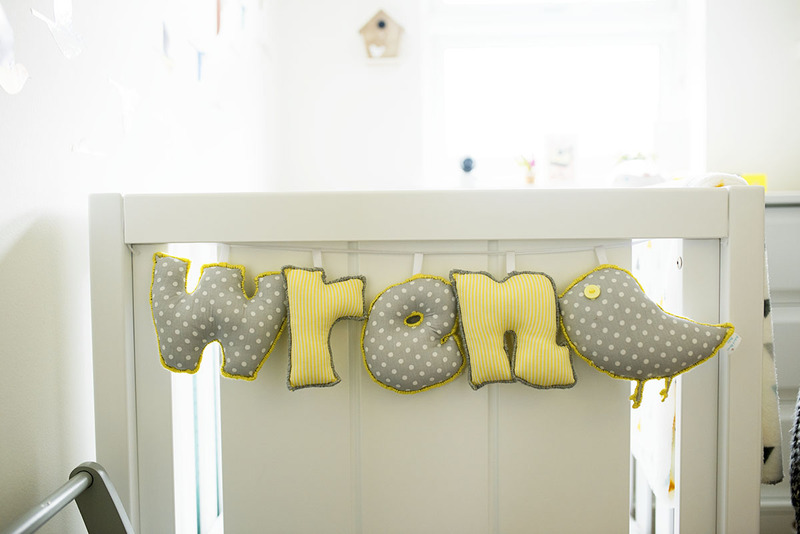 I absolutely love his name bunting which came from a gorgeous instagram seller called Baked Bean Baby. I think it looks really good hanging on the end of his bed. She makes all sorts of different garlands and styles. 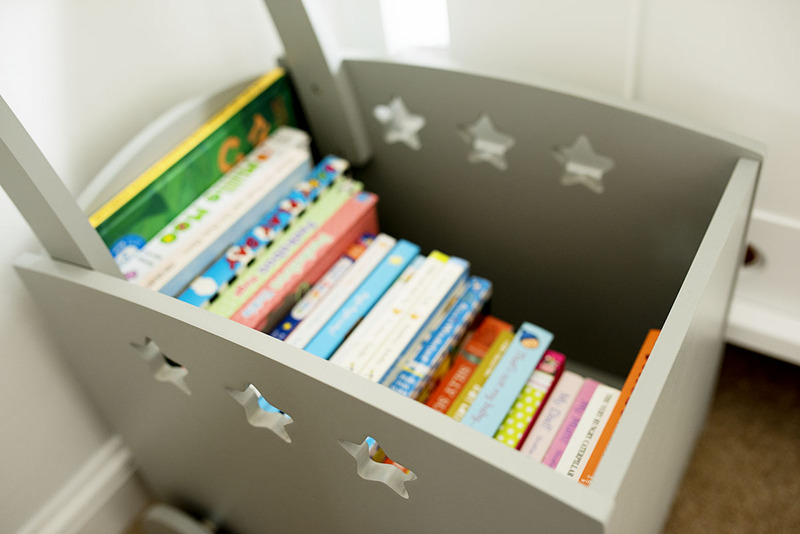 I love his little grey storage cart from Vertbaudet, which is filled with a lot of baby books that used to be his sisters- I am looking forward to reading some with him as he gets a little bit bigger. His pendant light is from Vertbaudet, unfortunately I don’t know if it has sold out but I can’t find it on the website anymore. His yellow bird garland in the summer is from Not on the High St, but the lady who made them is on instagram too. Finally his little projection light is the 3-in-one Butterfly Dreams Projection Mobile from Fisher Price. It starts off as a mobile for the cot, but we have taken it off so it sits on the side. It plays three different types of sounds, we have white noise and it definitely seems to soothe him as he goes off to sleep. And there you have it. That is his new room. I am so pleased with it, it feels so calm and bright as you walk in. Now I just need him to want to stay in his cot for 12 hours a night! 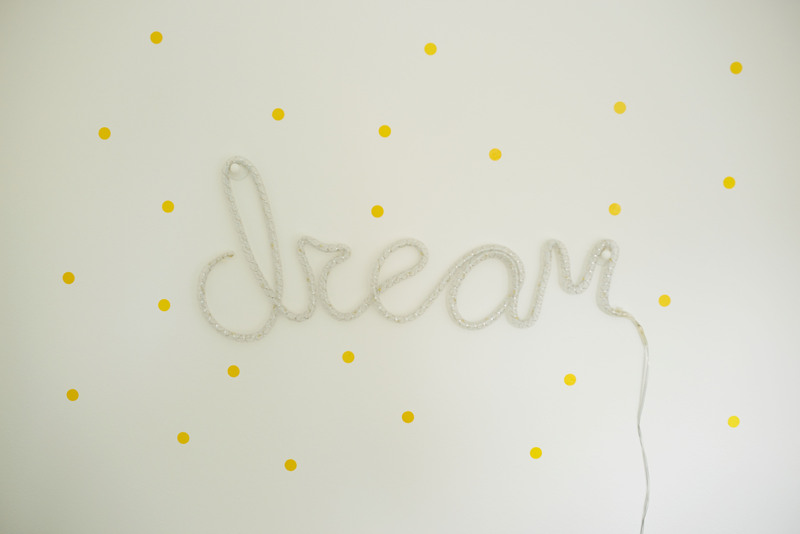 Oh Katie as always your decorating is beautiful and magazine style everytime You should be an interior designer. I honestly think you would be amazing at that too. Among all your other amazing talents. What a lovely nursery. Can you believe he has his own room? He is growing up way too fast. Look forward to seeing your garage /office space soon too. 🙂 Happy weekend.